All-Star Logistics Ltd. offers our very own in-house crate washing service. We wash and dry a wide-variety of Crates, Plastic Pallets, Totes, Boxes, Lids, and Trays (Returnable Transit Packaging) through our unique high specification stainless steel cleaning machine. Hygiene is of paramount importance in the crate and pallet washing market and we know how to incorporate the essential elements in a thorough cleaning routine for all of our clients. Why Choose our Pallet and Crate Washing Services? Our Pallet and crate washing service is one of our specialist services which we offer throughout Ireland. We can cater for all sectors such as the food industry, electronics, automotive, health and pharmaceutical and medical devices industries for plastic pallets, crate washing, tote cleaning and provide an expert service from start to finish at great value. Our 3-step crate washing system ensures that your crates are washed to the highest of standards and are returned fully dry and ready to use. Our cleaning technology means that we can handle a very wide variety of pallets, crates, and totes. 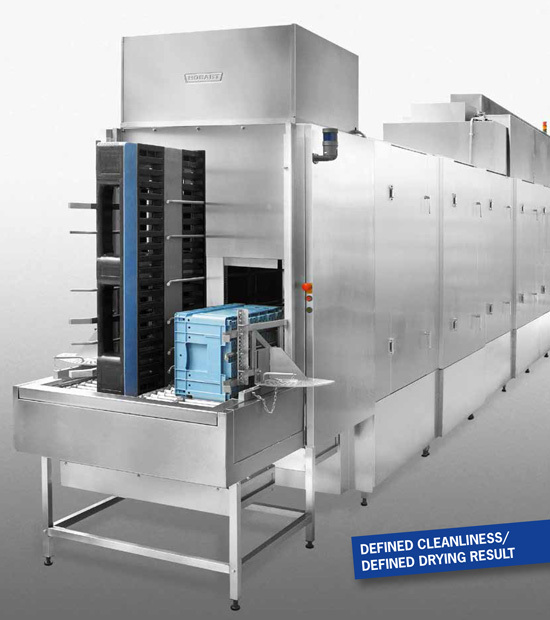 Our container wash system guarantees reliable cleaning results. High water circulation and the correct water pressure are largely responsible for a defined cleaning result. The wash system specifically developed for container washing has an innovative wide-angle nozzles FAN and does exactly that. The perfectly balanced system of mechanics, temperature, chemistry, and contact time solves the most complex cleaning requirements. It ensures constant and reliable cleaning results. We invested in a unique state of the art crate washing machine which is the only one of its kind in Ireland that can wash, dry and disinfect such a wide variety of products. With this special machine, we can now handle the cleaning of Reusable Transit Packaging (RTPs) for the Food, Health and Manufacturing Industry. Food industry we wash and dry trays for Supermarkets, Fruit & Veg Suppliers, Meat Producers, Dairy Producers, Bakeries, and Mushroom Suppliers. Manufacturing Industries – we wash boxes, trays and pallets for electronics companies in Ireland that send their products out in re-usable transit packaging and we then take back the packaging and clean it for its next journey. Pharmaceutical, Electronics and Automotive Industry – a large part of our business is providing a quick turnaround of clean re-usable containers and pallets for the health, manufacturing and pharmaceutical industry. We can clean Returnable Transit Packaging to the highest specifications required ensuring that all goods are handled in safe hygienic containers. Our sophisticated crate washing and pallet washing service saves companies thousands of euros each year by re-using existing packaging instead of buying new for each use. By washing and drying used pallets, crates, totes or trays and making them like new again All-Star Logistics Ltd. is helping to protect the environment by minimising waste and re-using existing valuable materials.